But surely self-indulgence is the province and privilege of the writer. After all, much as we protest to cater for our readers, first we must like what we’re writing ourselves. I love fantasy, I love sci-fi and magical realism, and I love young adult. So this is what I write. I could never do justice to a gripping crime thriller or police procedural because I rarely read them (never say never!). I love jeopardy, so I write it. I love to see my protagonist compromised or vulnerable in some way, but to come out the other side a stronger character, so I write it. I love happy endings, so I write them too. There is a long-standing joke amongst my friends that I can’t write a story without snogging. So guess what? But is it right to simply sit at a keyboard and please yourself? What about the author-reader contract? What about fashions and editorial requirements and moral responsibilities? I have read many disgruntled reviews over the years that complain of the writer of some book or TV series not paying the slightest regard to the wishes of their audience. Lost is a case in point – viewers hated the ending because they felt they had in some way been cheated. Yet some self indulgent writer sat at a keyboard and ended it just the way they wanted to. The same can be said for BBC’s Merlin – for 4 years the writers steadfastly refused to give the magical reveal that they knew their fans were clamouring for and, seemingly, only budged in the end to avoid the death threats that would undoubtedly come their way if they didn’t, not to mention the fact that the climax created a distraught army of fans just in time for Christmas day. Aren’t you proud of me that I resisted the urge to post a Merlin photo here? The other side of this is the dreaded market. I don’t say this because I have no regard for the people who may read my books, but because I never seem to be able to fit into the industry categories, nor, indeed, stay in one when I do. I tend to flit from style to style, depending on my mood, and through genres and sub-genres. It’s early days, but I suspect it might prove difficult to sustain a loyal audience this way. Recently, I’ve begun final edits on a YA romcom, a bleak YA paranormal story and an NA thriller/urban fantasy. 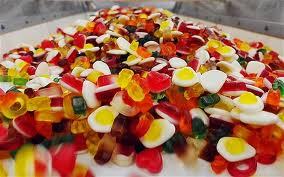 If life is like a box of chocolates then I’m afraid that my brain must be a bag of Haribo. For now, I have to write what I love, self-indulgently and regardless. Only that way can I produce a story I love and hope that others will too. Neither Mickling nor Muckling was the weird saying that my late mother-in-law used to utter every now and again. At the time I wondered what it meant (Billy Liar fans feel free to get rancid tomatoes at the ready) but I think I have a pretty good idea these days. This week I handed out three different manuscripts to three good friends. None of the manuscripts was remotely like any of the others. I’m one of those annoying, mercurial types who can’t stay focused on one thing for long; instead, I dip into pools of knowledge and interest all over the place – science, history, archaeology, literature, philosophy – a little of everything and mastery of none. And I’m moody too, so while I seem to be my usual cheery self every day, underneath that I’m sometimes melancholy, some days introspective, some days just plain vacant. So I suppose it’s only natural that my writing brain functions in the same way. The project I work on today might be a quirky romance, but next week I might start a horror story. Sometimes it will be a big cross-genre mash or completely defy classification at all. And often, something that I thought was amazing when I wrote it will annoy the hell out of me and end up deleted the following week. Which got me thinking. By writing this way am I actively scuppering any chances of actually writing for a living? The publishing world is so fond of genres and pigeon holing and people in general seem to like things where they can say: yes, this fits just here. I recently read a tweet from another writer saying that she wondered if she was unsellable because her work was cross-genre, and although I can think of lots of successful examples of work in that vein, I can probably think of more where it represented problems getting the work accepted for a long time. If you write lots of stories in lots of genres, do you risk alienating readers too? If someone loves your quirky romance (just let me dream for a moment, will you) and they go looking for more (ok, I know it’s a stretch – indulge me) and they download your next book to find it is some paranormal weep-fest, will they be so disappointed that they will never read anything you present to them again? Can you build a following of loyal readers like that? Can you sell books like that? But then, can you change what you do? Are you a slave to your writing brain, the one that won’t stop nagging you when that ghost story pops into your head, even though you’re in the middle of a kids’ book? I’m certain I can’t be alone in this confusing camp. So, I suppose what I’m really asking is this: is there is a choice to be made here? Do I slap the metaphorical bottom of my writing brain and tell it to start behaving itself, or do carry on doing what I do and I accept that I’m destined to annoy the hell out of people for evermore?